The Wages of Wins Network is a group of stat and sports lovers. We enjoy looking beyond conventional wisdom to explain how sports work. 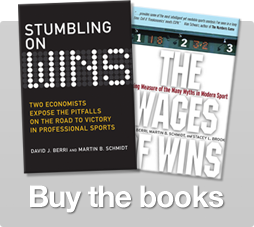 It was started back in 2006 by Dave Berri to promote the release of his first book “The Wages of Wins”. Since then many others have hopped on the bandwagon to write about sports with a keen analytical eye. Here’s our roster of talented stat heads. Dave is a professor of Economics at Southern Utah University. Dave has over forty published papers in Sports Economics to go along with two books. He also was the president of the North American Association of Sports Economists. He brags he watched all 16 games in the 2008 winless Lions season. Dre tries to make sure we have a post out Monday-Friday and does so with a bunch of help from great contributors. He’s a software developer by trade and has done his fair share with modeling wins produced. Dre has been an on-again off-again Nuggets fan for the last 20 years. Devin has degrees in Human Kinetics and Education. He’s been a long time Raptors fan through both the good and (mostly) the bad. As a result Devin is also an expert in matters of the NBA draft. He’ll quickly explain to you why Bargnani is not a good player while also offering insight on how the Raptors could be contenders. Patrick is the lead developer and writer at The NBA Geek, home of the best advanced basketball stats tools on the net. Patrick has years of experience playing basketball recreationally as well as several years coaching youth basketball. Arturo is an Electrical Engineer and Six Sigma Black Belt in the lovely isle of Puerto Rico where he applies his talents to good honest work (most of the time) by keeping his production lines running day and night (and weekends) and works on sport analysis in his free time. He was the first to answer Dave’s call for guest writers and the big brain behind so much of our model building. Arturo is an avid Boston sports fan (and that includes the terrible 90s). Mosi works in security and always has his Blackberry near. Long before officially joining the Wages of Wins Network, Mosi was a regular contributor at Bleacher Report. Mosi has been running his own numbers for many of the Heat games for years now. Mosi is constantly watching NBA games and can be found offering live twitter updates during games. Greg Steele is a student at Abilene Christian University and a long-time Houston Rockets fan. Being short and round (and not like Charles Barkley), Greg is a basketball watcher, not a basketball player. As such, Greg was attracted to statistical measures which recognize the contributions of round and clumsy players as well as those of the more aesthetically pleasing players, so the Wages of Wins was a natural fit. Jeremy is a designer and brings his 15 years of advice and expertise to the Wages of Wins Network. Short on time thanks in part to a new bundle of joy, Jeremy still manages to try and help the team tidy up the web site and offer insight into the Golden State Warriors. Jeremy holds that his Warriors will be able to reach the elite level of the NBA again. Ben Gulker is arguably the biggest Pistons fan in the Wages of Wins Network, even in front of Dave Berri. He has been trying to help spread the word of good stats to help his Pistons, including postings at Detroit Bad Boys. Hopefully things will improve. Vivek is a student who has become very interested in the analytical side of basketball. Before joining the Wages of Wins, he wrote for Nets Are Scorching. He has been a Nets fan since their back to back Finals runs and has been patiently waiting for the team to be good again. Ari Caroline is the Director of Quantitative Analysis and Strategic Initiatives (QuantStrat) at Memorial-Sloan Kettering Cancer Center. The QuantStrat team, which Ari helped to establish, leverages the power of data and analytics to shape strategic decisions at MSKCC. Over the past eight years, QuantStrat has used information from MSKCC’s centralized database (containing records on the longitudinal care of almost half a million patients) and a wide variety of analytical methods to deeply understand the current state of hospital operations; anticipate changes in the fields of healthcare, science/technology, and policy; and develop strategies that strengthen MSKCC’s position at the forefront of cancer care and research. Ari holds an MBA from Yale University, with coursework towards a PhD in Financial Economics. Josh Weil shares a last name pronunciation with the 34th president of the United States, Dwight D. Eisenhower. Josh graduated UC Berkeley in December 2011 with degrees in economics and business. He currently works as an analyst for LitiNomics, a firm that calculates damages in commercial litigation and provides expert witness testimony. He enjoys the crossover between economic consulting and basketball analysis, and aspires to use logic, data, and creativity to impact the NBA. Jill earned her Ph.D. in economics from Oklahoma State University. She has taught Principles of Microeconomic theory, Economics of Sport and Economics of Crime for more than 20 years in public and private institutions and is currently teaching at Pitzer College and Pomona College. Her research interests include cheating in the NCAA, detecting the Hot-Hand in sports (especially water polo), and non-compliance behavior in organizations and industry.